Off-Site Insight by First Base Solutions: RAQ: How Does Image Resolution Relate To Map Scale? "one centimeter = five kilometers"
Scale is easy to understand on printed maps which are typically vectors (points, lines, areas, and text), and this is how many people first learn about geography. Some confusion creeps in when you see a map drawn to a specified scale posted online; zooming in does not change the scale, even though you're making the map bigger. It's the digital equivalent of moving your face closer to the paper. You won't see more details as you get closer. Vector maps use scales, but raster (rectangular grid of pixels) maps like orthophoto use resolution. Photo maps made with aerial imagery are extremely popular but poorly understood. The aerial imagery, like any other digital image, is made of pixels. When the imagery is orthorectified to correct for movement of the aircraft, the image is sampled so each pixel will cover the exact same area on the ground. In a 30cm image, for example, each pixel covers an area on the ground of 30cm x 30cm. When you add aerial imagery to your mapping project, assuming you purchased a 500m x 500m georeferenced image tile from MapWarehouse, whatever reference scale and projection settings you've selected for your project will be applied to the 500m x 500m dimensions of the tile. The ground coverage of each pixel remains the same no matter what map scale you display the image at. Maps created using combinations of imagery base layers described by resolution, then augmented with vector mapping sources described by scale need to have internal consistency in the level of detail coming from the various data sets. To put it simply, how zoomed in can the image be before it looks blurry? I'm Mapping At 1:2,000 Scale, What Resolution Should I Use for The Image Base Layer? Review the chart above. Find the map scale that your final composition will be or that matches your source vector files. The corresponding resolution is the minimum quality that can be used without noticeable blurriness. If in doubt, aim for a slightly higher resolution than you need. If making a 1:2,000 map for example, you should use imagery with a resolution of 80cm or better. 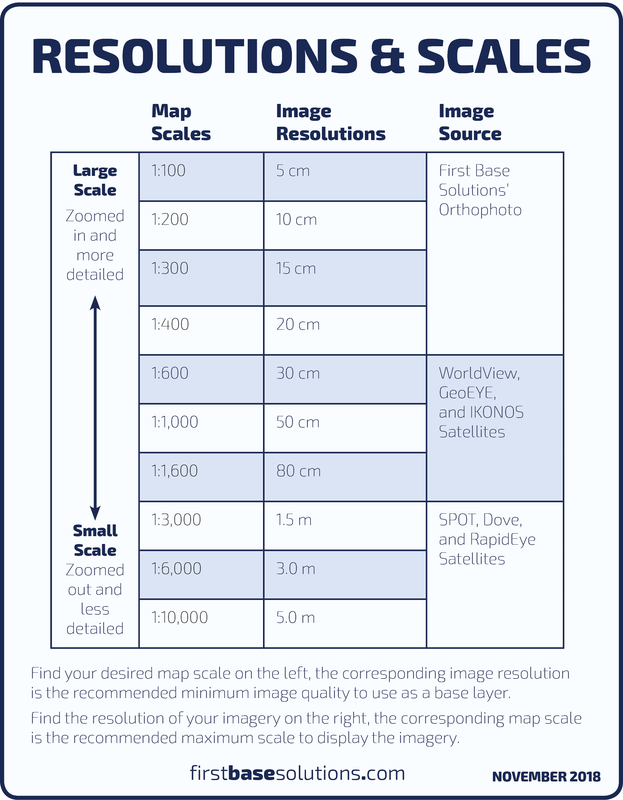 Alternatively, if you're starting with imagery, find the image resolution in the chart, the corresponding map scale is the maximum scale the final map should be designed for. Below is a series of screen captures of the same images displayed at progressively increasing map scales. Each image is of a different resolution laid out as in the diagram below, centered on the intersection of the four squares. Each image below is made of four different images at different resolutions. Immediately, you can see the cut lines where the colour balance is a little different in each image, but the clarity of features on the ground is similar. Here's the recommended limit for the 1.5m imagery on the bottom right. Look at the image at original size and you'll see how it's noticeably blurry compared to the others. Here at 1:500, the 30cm image on the bottom left is just beyond the 1:600 limit and begins to blur. The top left image at 20cm resolution maxed out at 1:400 scale. Here you can see only the 5cm image at the top right is still clear. Finally, this is as close as you should go with a 5cm image. Where Can I Get Good Imagery?